The Red Deer Rebels will host the 2016 CHL Memorial Cup later this month. Thomas Hopkins is trying out a new look for the team in today's concept. I don't mean to get all philosophical on you, but I have to ask: Is it still a Calgary Flames jersey if it doesn't have a flaming "C"? Thomas Hopkins doesn't seem to mind. Outdoor game concepts have started rolling in again, so we're switching our Saturday focus starting this week. Thomas Hopkins presents this gorgeous pair of jerseys for the 2015 NHL Winter Classic between the Capitals and Blackhawks. Welcome to Minor League Week on the Concepts page! And just to get really crazy, we're doing individual theme days within this theme week. As you can see, today is about the American Hockey League. 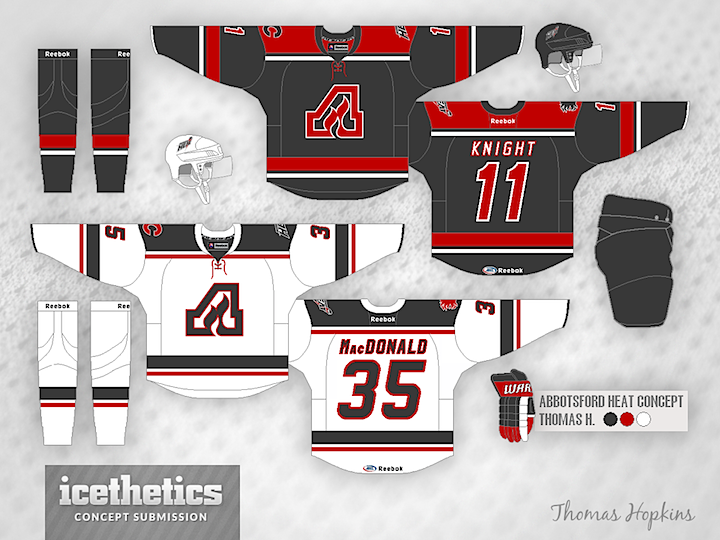 Thomas Hopkins gets us started with this clever use of the old Atlanta Flames logo for the Abbotsford Heat. I think a grey and red team would look fantastic! 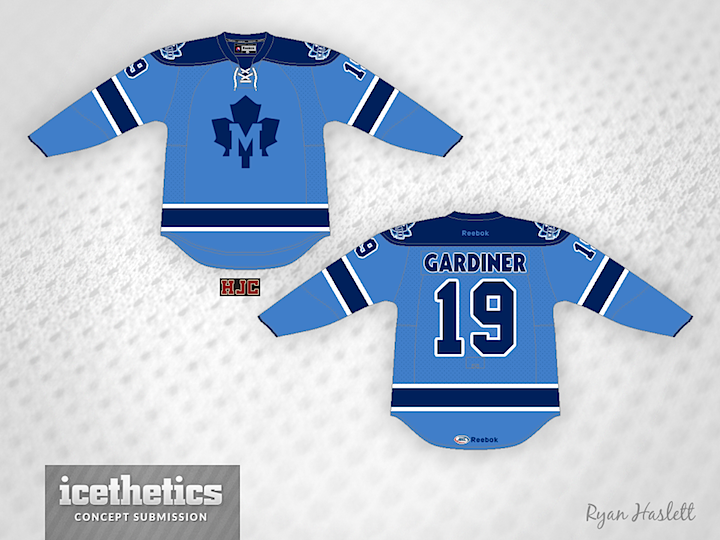 Ryan Haslett decided to get a little creative with his hometown Toronto Marlies, creating a new crest to go with his two-tone blue sweater. Another solid one there! 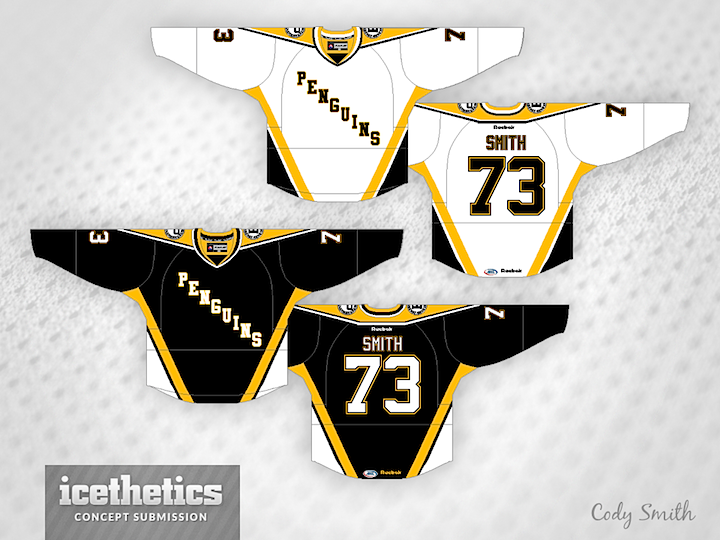 A newcomer to the Concepts page, Cody Smith reimagined the Wilkes-Barre/Scranton Penguins a little with this wordmark-centric uniform set. The throwback to the Pittsburgh jersey from the '90s saves it. 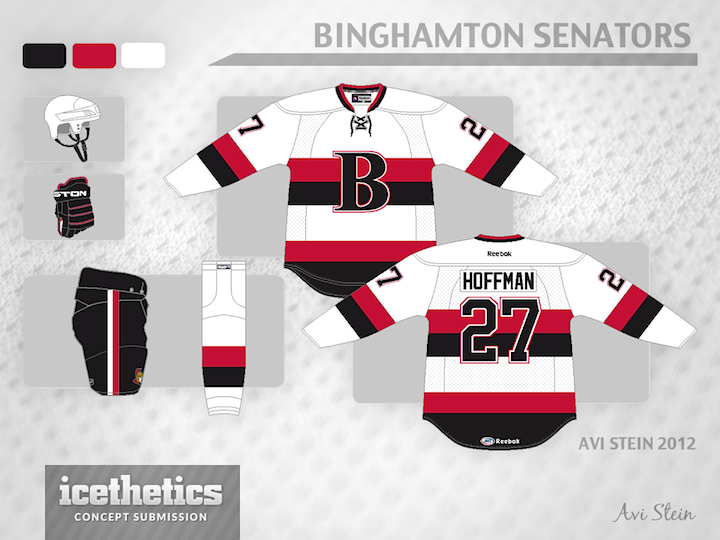 And we'll wrap up with Avi Stein's idea for a Binghamton Senators third jersey. The "B" works just as well as the "O" there — if not better! Tomorrow we'll see some of the entries to the ECHL's 2015 All-Star Game jersey design contest. We know the Stars are expected to introduce new logos in a couple weeks, but it's likely the slanted star form will continue to be incorporated somehow. Thomas Hopkins basically kept the logo the same but redesign the sweaters with a lot more green and gold. Todd Varga, on the other hand, stuck to black and white jerseys, but increased the amount of green used. I can honestly say I like this version better. Might be the simplified logo. I'm a sucker for simplicity.